Young starts his explaining of “Holistic Learning” by saying that he has always remembered everything and didn’t realize everyone else weren’t that lucky. Once he made that connection he soon discovered that his peers didn’t learn things the same way he did. His model has six steps called Acquire, Understand, Explore, Debug, Apply and Test. Young emphasizes that the process for using the steps is iterative instead of linear but to simplify I’ve chosen to show the steps in a more broad sense, which therefore becomes linear. At first you learn what’s in the book/lecture by reading or hearing it. Then your brains immediately start trying to understand it. If it’s something completely new or complex it’ll take some time but eventually you get a basic understanding of context and what it means. Young also mentions that here is where many people end their quest for learning the subject since, if you reread and cram this into your head, you might pass the test on pure rote memorization. The big step in Young’s theory is what he calls Exploring. Here you start to create your own mental model of what you’re trying to learn. He shares lots of tools to do this but the end-result is always a model you could look at and connect all facets of the subject onto. For the model to become complete he urges you to go deep into the details, background and use of the ideas presented in the subject you want to learn. If it’s a history subject regarding 18th century USA you might also want to look at what happened in 18th century UK since they’re connected. He also urges you to connect the model, once it’s formed, to completely DIFFERENT subjects, e.g. biology, mathematics or systems theory, to get the whole holistic approach. Young argues that if you compare your mental model with a totally different outside model you’ll get even more associations for your brain to connect your memories through, and it’ll be even harder to forget. In this second step of forming your mental model it is very important to constantly debug the model. All incorrect assumptions should be discarded and if the model doesn’t work in all ways possible it must either be changed or the exceptions noted. Young ends his theory with the biggest performance booster of them all, you actually APPLYING what you’ve learned in real life. Are you taking an economics class? Try to apply it in your home business! Are you taking a French class? Try writing your resume in French or travel to France as soon as possible! If you don’t apply what you’ve learned, and really test it out, you won’t cement it into your memory and you won’t actually have any use of it. And you certainly didn’t take all of those courses in college without any thoughts on using them, did you? The model is illustrated in a circle instead of this linear fashion but that “circularization” doesn’t really improve this explanation so I remade it into what you see here. In the first phase the students builds their knowledge in a subject. They tells the teacher what they or their peers already know, they read texts and notes all difficult words for immediate look-up in a dictionary. The teachers do not serve the answers or explanations but the students must find these out for themselves. With guidance if needed of course. In the second phase the students gathers other examples of how to explain and write about the subject. They also create a common model together in class. In the third phase this common model is used as a guide when they create their own texts explaining the subject. Again, this final writing could be done individually or in pairs. Having taught physics for many years Mazur came across some research showing that students didn’t actually attain much deep conceptual understanding of the subject taught on lectures. They passed the tests purely on rote memorization. Mazur didn’t believe it until he tested the theory in class with devastating evidence of the theory’s accuracy. By a stroke of luck he realized that the peers in the classroom could better explain something to one another than he himself ever could. He, as a professor, had too many theories explaining something that he couldn’t remember how it was to learn the subject for the first time! Therefore he just didn’t get what the students didn’t get. He also soon discovered that if you had two students, one with the correct answer and one with an incorrect answer, the student with the correct answer always had it easier to change the mind of the other. It was almost like a force of nature! Utilizing these new found discoveries he backtracked on how he lectured and applied Peer Instruction. The boring transfer of information, classic lecturing, was replaced with self-study and in-class peer instruction with him giving the class the explanation AFTER they all discussed and shown each other of the correct solution. With this deeper assimilation of the subject in class the learning deepened also on the conceptual level for when the students would apply what they’ve learned. This was clearly shown in the assessments in which the students with Peer Instruction classes doubled the result compared to those with ordinary lectured classes. Roger Schank at Socratic Arts has the idea that a good curriculum should consist of a story in which the students play a key role. Clarke Quinn had a similar thinking in his post “Rethinking Design: Curriculum” and I’ve taken the liberty to merge these two theories into one. The main idea here is that all classes or lessons should contain assignments building onto each other to form a story. Each and every consecutive assignment is harder and/or more complex than the one before maybe utilizing a new supporting document or involves an additional new task. This all leads to an involving story that, when it’s finished, should have let the students experience a “close-to-real-world” situation before getting out there on their own. The teachers become facilitators and as such all information finding is left to the students. The facilitators might point the way as to where they could find it but there’s no lecturing or “teachers doing the students’” job. What the facilitator WILL do is make sure that the students continually reflect and build their conceptual understanding of the assignments. They should make sure the whole class is on the same page in the curriculum’s story with several occasions with common reflection and model and/or conceptual support tool building. By continuously creating and recreating their own guides for their assignments the students “grow with the task” and at the end of the course they will not only have an understanding of what documents and other content to use when/where, but they will also have their own cheat-sheets, checklists, job-aids, performance support tools, guides and process descriptions. So, do these theories look alike? The theories all start with what most schools end with, i.e. the transfer of information. It goes from the textbook or whiteboard into the notebooks and, hopefully, into the memory of the students. Ending here, however, will not make sure the students really GET the ideas in the textbooks. Rote memorization is only good enough for passing assessments – not for learning how to apply it in real life. In the end, the only thing that matters is what all theories end with, the APPLYING of what was learned. When you apply what you’ve learned you get something out of spending all those days trying to make sense of things. Suppose Johnny is in a basic statistics course. He understands the basics of the formulas and remembers the examples his professor gave when solving mathematical problems. Now Johnny is given a problem on the test which requires him to use the formula in a slightly different way than he was taught. He can’t do it – the problem is in exploration. However, if Johnny breezed through the test, chances are his exploration is strong. But, let’s say, he is later confronted with a problem with a statistics problem in his life. Will he make use of the principles he learned during the course and apply them? Or will they not be able to make the jump from classroom to real-life? If he can’t – that’s a problem in application. 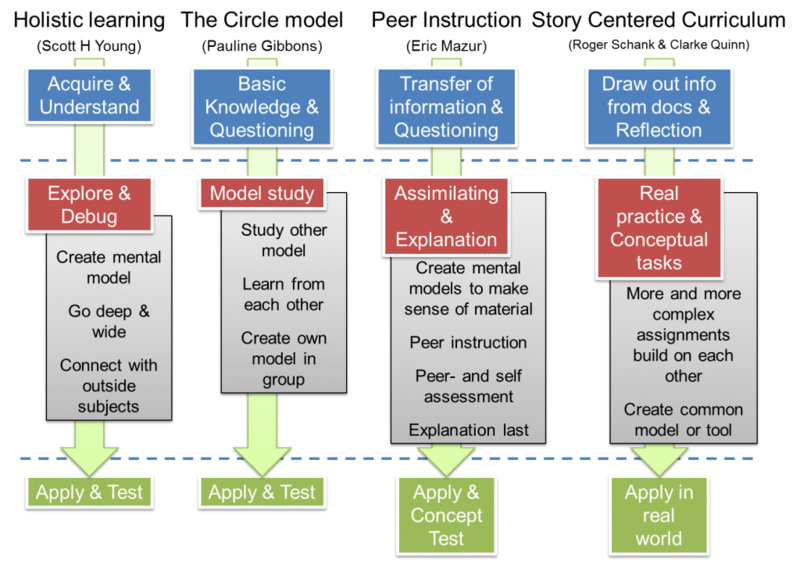 Teachers, or facilitators, need to make sure students really explore all aspects of the subject and they should also make sure that they, during the course, gets as close to a real world application as possible. In my own opinion I also believe teachers should get hold of parents or managers, i.e. the ones back “home”, and make sure they’re on board with following-up on the students’ progress. Application of what’s been learned is crucial. Great post. Do you agree on that the common trait is constructivism? Can the models substitute each other or do they exclusively match into different applying scenarios? I would like rephrase the conclusion to “applying is the learning”. And then as a consequence, nothing which cannot be applied should be learned. COnstructivism in the sense that you have to create your own model and thinking around new learnings, yes! I think that the models mostly are one and the same. My post shows just greatly simplified versions of the models but if you’d take a deeper look into each you would find things that might differentiate them more. However, I do think that these differences could be leveraged cross-model wise anyways. The Holistic Learning model is much more focused on you as an individual than the others that more focus on cooperation with peers or other participants. I like your rephrasing but I think they should be used in tandem: First you learn, then you apply, by applying you learn more, then you can apply that… It’s a neverending story! If something CANNOT be applied… Then you haven’t done enough exploring on the subject! But yeah, if you’ve struggled with trying to find a way to apply it for days and fail? You should probably drop it since it doesn’t have any real-world relevance – for you.